This collaboration with Mutual Dreaming's Aurora Halal is the latest in the renaissance of Ital's Lovers Rock imprint, which has also see excellent singles from himself and Earthen Sea recently. 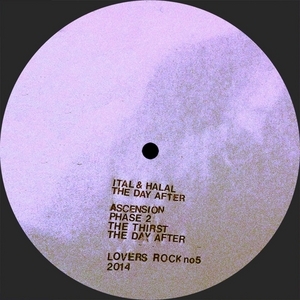 While Ital and Halal both individually make dance music that is psychedelic and driving, yet optimistic in tone, The Day After is marked out by its combination of Ital's more brittle elements and Halal's deeper, stranger textures. The delicate "Ascension" is filled with fluttering sci-fi textures that dive into hypnotic territory, while "Phase 2" delves into a nebulous haze. "The Thirst" comes across like a more psychedelic take on Robert Hood's loop techno, while "The Day After" delivers a more moody, downbeat piece of techno reminiscent of Terrence Dixon. There are countless producers making strange takes on house and techno mining the influence of Detroit for inspiration, but none are doing it as respectfully or with as much originality as Ital & Halal.